Just finished the last of the drawstring bags for Christmas gifts – eighteen here, twenty-one in all. Just in time for tomorrow’s Friday afternoon knitters get together. For the most part I was able to fabricate these bags using fabric for the outside and lining, for the drawstring channels, buttons, wooden beads, from the supplies I had on hand. I did have to buy 6mm grosgrain ribbon and a few wooden beads to finish the last few but for the most part I used what I had. That doesn’t mean there was no cost associated with the bags but it feels differently (like free) when I don’t have to go out and buy specific supplies for a project. Now back to quilting the Layer Cake Quilt. Hoping to finish it this weekend. 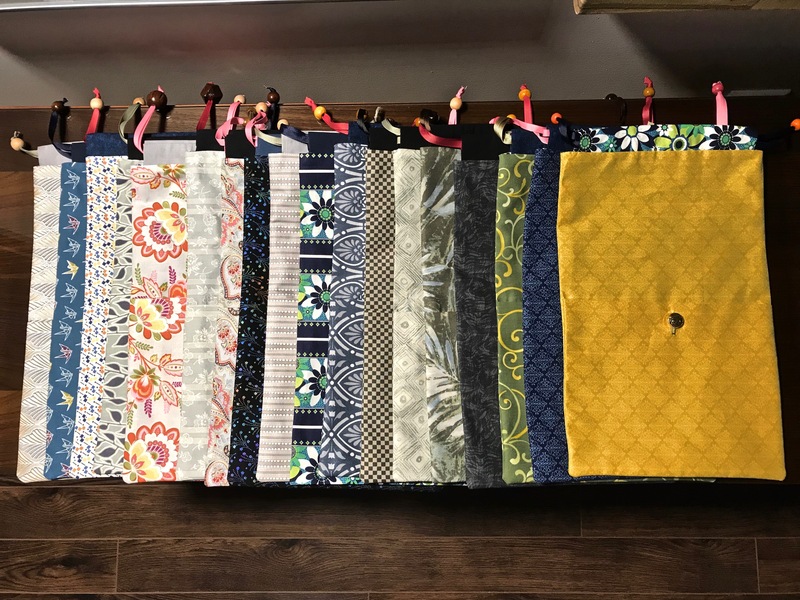 Just finished the seventh shoe bag – fourteen to go. Here is this year’s Christmas gift (last year I gave small zippered bags) – a drawstring bag for carrying shoes during the winter. They’re not large enough for sneakers/running shoes, but if it’s a snowy day and you’re wearing boots, then this bag is perfect for bringing along a pair of “lady’s” shoes. It’s also a great size for carrying knitting or a hand sewing project, a book, art supplies, even makeup. 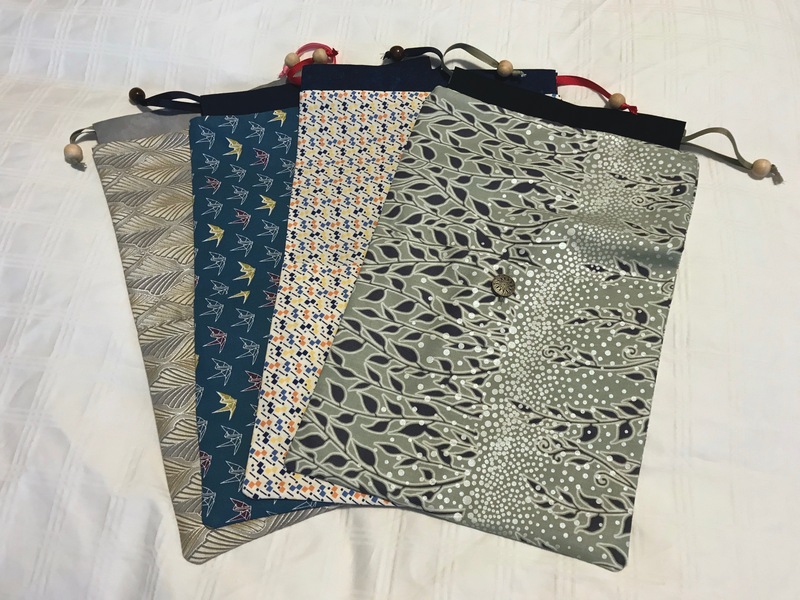 I was originally given a drawstring bag by a Japanese friend and it was immediately obvious the design was better than any I’d ever made – it was lined, made with separate channels for the drawstrings, and a buttoned pocket on one side. 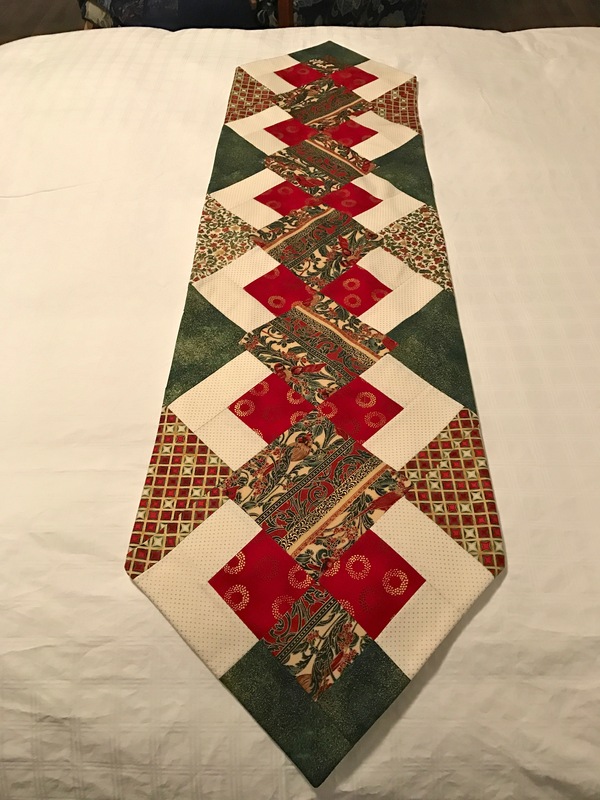 I was limited by the width of fabric strips I was using – I’d pulled from the 9″ scrap bags (Keepsake Quilting puts together sets of coordinating fabrics using twelve 9″ width of fabric cuts of both printed and batik fabrics) fabrics I didn’t think I’d want to use in a quilt. So the final size of each bag was limited to 8 1/2″ x 16″ (don’t forget 1/4″ seam allowances). The drawstring channels are constructed from two 2 1/2″ x 17″ strips of fabric, sewn to form a circle, turned right side out and folded – long, raw edges together – and pressed. Each channel is inserted (raw edges to the opening) between the outer bag and the lining (which is placed right side together over the stitched outer bag). The top edge is sewn with a 1/4″ seam. The lining is pulled over the bag, the bottom end serged and the lining pushed inside the bag. I used narrow grosgrain ribbon for the drawstrings, used some smallish wooden beads (with large holes) to secure the ends. The drawstrings are strung through both channels, one from each side. The first three bags have already been gifted – they were samples to establish size and production details. 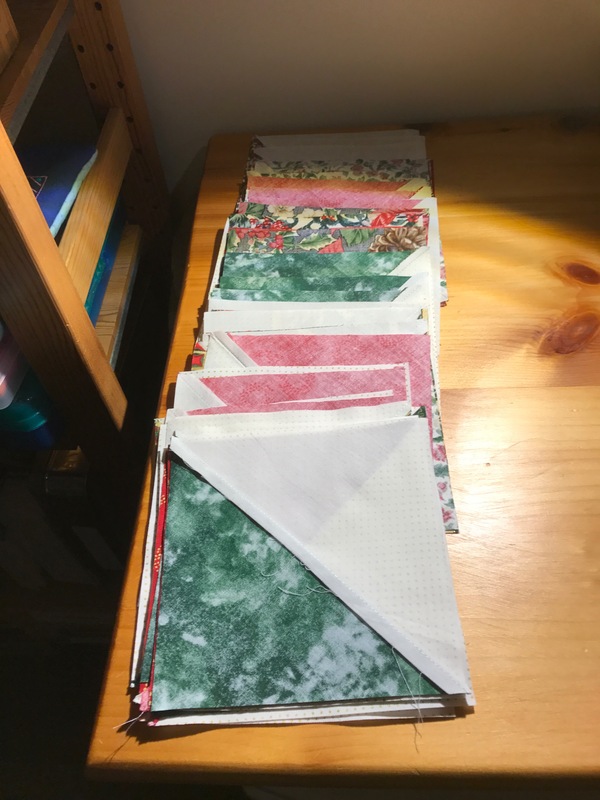 They lacked front pockets – didn’t think of adding the pocket until I started cutting the scrap bag fabrics – after cutting the two 17″ pieces for the length of bag I had just the right amount left for a lined pocket! So now back to the sewing machine to assemble another batch – it’ll probably take me one more day to finish up the twenty-one bags I need. Never ceases to amaze me how my brain keeps working while I sleep and when I wake I have a solution to the problem I walked away from (temporarily). I trust my sleeping brain implicitly – it always comes through; there’s always a solution the next day. That was how I worked when I was writing – stop when I got to a place where I wasn’t sure how to proceed – next day, ideas were just there! Always! 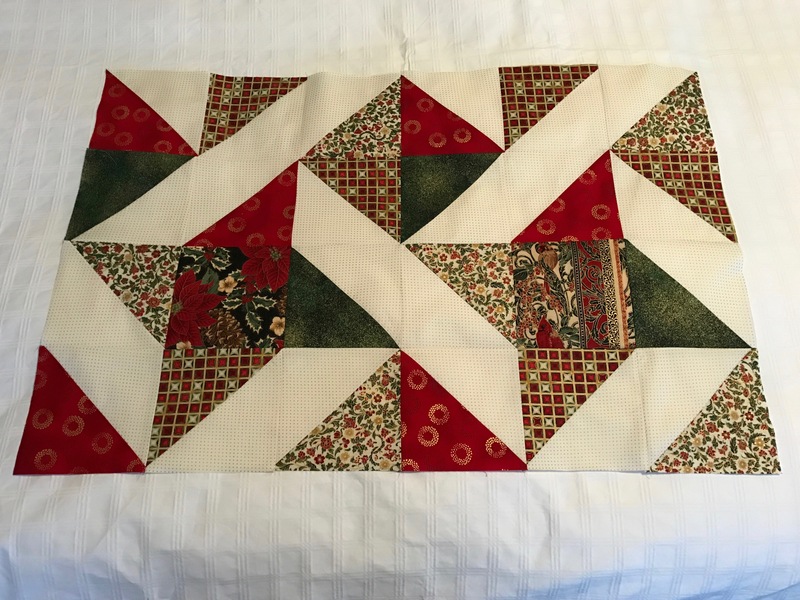 Same with the quilting – walk away from a decision point, come back next day and there’s a way to work things out. 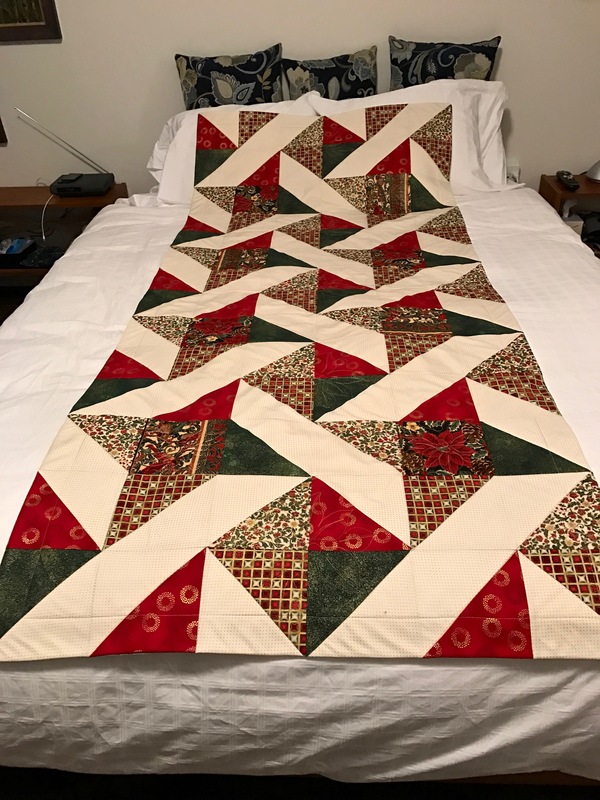 Last night the problem I needed to solve was how to quilt the light diagonal spaces in the quilt because the fabric expanse was too big (4″ x 20″) to lay flat – I needed to fill the space with something. I thought about just straight line quilting but that seemed too boring. I woke this morning thinking about stippling and knew how to set that up. I traced the light diagonal shape onto paper, sketched in some stippling, scanned the drawing, opened the image in Photoshop and scaled it to the right size, saved the image, imported it as background into my TruEmbroidery Create software and created a design based on my sketch (had to do some adjusting to balance the fill). I did a test run to see how the stippling worked out – it was perfect! Just the right size for the space. 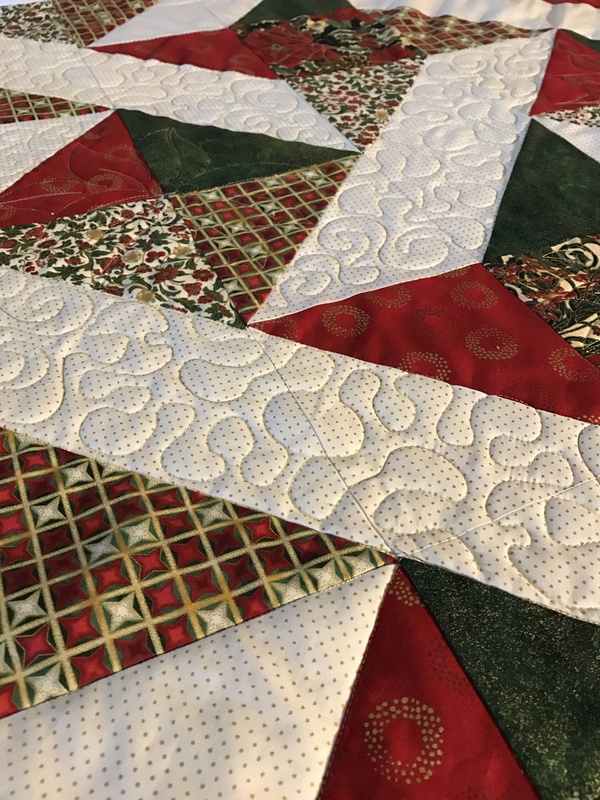 So far, I’ve quilted in eight of the spaces – I have four large ones, four light triangles and eight smaller diagonal pieces to go – that’s three different embroideries, in all, to fill all the different shaped light areas. I’ll probably work at this some more this afternoon, and it will still take at least another day, if not two, to complete the fill work. Overhead: $0 – I won’t cost the electricity to run the machines, the iron, the lighting in the studio, rent for the studio space. Supplies: $100 – the backing fabric alone cost me $40 (cotton fabric these days is ~ $20/m) – then there’s the four half metres of red/green printed fabrics, plus the metre of dotted cream fabric – so $100 is an estimate, my materials may have cost a bit more and I’m not counting in thread or machine needles. Batting: $30 – batting is $26/m plus tax – the cotton needle punched batting I buy is 90″ wide so I needed a metre. Labour: $20/hr – I’m a skilled artisan, my time is worth more than minimum wage! My education consulting hourly rate used to be anywhere from $100 – $200/hr, my web design hourly rate is $50/hr. I should be charging the same kind of rate for the sewing/quilting but let’s go with $20. I will have put in at least 15 hours (probably more over 7-8 days) to make this Christmas table topper so labour = $300. Total cost for the topper were I selling it: $430. However, the topper is a gift for a long-time friend; it’s a labour of love. I’ve worked on this project all day – started quite early piecing all the small blocks together. Then I discovered I hadn’t bought enough backing fabric so I had to go out (just as the storm was starting) to pick up 2.1 m of backing fabric to be able to cover the length (81″) in one piece. I’ve done about half of the stitching in the ditch. I got bored, so I set up an embroidery design to quilt the eight small squares and the “diamonds” in the centre. That’s now done. I’ve stitched around the outer edge 2″ from the edge to establish a border. I chose not to bind the project, instead, again I did a pillow case finish with the back. Because the edges of all the blocks are cut on the bias, I’m having trouble getting every section of the topper to lay flat – it’s most obvious in the light diagonal sections – the way to solve that, of course, is to embroider/quilt each section and I may actually do that tomorrow. It isn’t quite as simple as it sounds because each of the long light diagonals is 17″ – I don’t have a hoop large enough to do that. so each of those sections would have to be done as two embroideries. Hooping each of those areas, however, would stretch the fabric flat and the stitching would hold the fullness in place so the topper would look flatter. I’m going to sleep on it! Finished dimensions: 35″ x 81″ (to fit a 34″ x 80″ table with both extensions open). I used the leftover fabric from the table topper to make this runner for another friend. It should look nice on her dining room table. It’s constructed on the diagonal – that’s how it’s possible to have the central “diamonds” overlap the triangles on the sides (with the addition of a narrow strip attached to the light strips to create the illusion of overlap). Took a bit of fiddling to piece the top and I made some mistakes that I took apart and redid – which is why the two mid-side triangles are a different fabric! (They were meant to be the same as the other red/green fabric). In the end, however it all worked out with the fabric I had on hand. I chose not to bind the runner, instead attached the back using a “pillow case turn” – I just didn’t have enough of any one of the prints to do a complete binding and the point was to complete the runner without having to buy more fabric and, besides, I like the neatness of the finished edge – nothing to distract from the basic elements. Now back to the table topper – the pieces are all lined up on my sewing table ready to be chain stitched and the top assembled. It’ll take a couple of hours and it will be done, too.